Last summer, 17-year-old Aaron Schorr, a neophyte to political activism, stepped into the lion’s den. He volunteered for aPeaceNow information stand in downtown Jerusalem, where the mood these days is tense, hawkish and generally hostile to left-wing messages. As Aaron handed out anti-occupation literature, two Haredi (ultra-orthodox) teens confronted him. Wasn’t he ashamed to belong to such a traitorous movement, they scolded. How could he talk about Palestinian rights? After all, Torah taught Jewish supremacy over the gentiles. Though Aaron was bare-headed and looked typically secular, to the Haredi boys’ astonishment, he countered their Jewish supremacy “nonsense,” as he calls it, with quote after quote after quote from Biblical sources. His opponents went away marvelling that a lefty could be so conversant in scripture. Little did they know that though he’d left religion, Aaron had been raised orthodox. De-bunking their stereotype was a tiny victory perhaps, but still, for Aaron, a step forward in the long, uphill slog to change Israeli attitudes. “Even just convincing people we’re not the enemy is progress,” he says. Despite his youth and inexperience (he’s been a Peace Now volunteer only for nine months), Aaron has developed a wisdom beyond his years, a healthy blend of idealism and realism. Born in Jerusalem to left-leaning orthodox parents who’d emigrated to Israel from America, Aaron was raised with a social conscience. By seventh grade he regularly read newspapers and took part in family discussions. He went to a religious high school in Jerusalem and it was there that he began to grow a thick skin, for his liberal views collided with those of his peers. He lost friends, received threats, was called “every conceivable name on earth.” The experience seems to have been good training for Peace Now work. Last summer, Aaron answered the call for recruits to the newly established youth department at Peace Now. He began attending chat groups and meetings. He volunteered for those information stands in the middle of town. In September 2016, when the head of the fledgling youth group had to leave for army service, the leadership position was offered to Aaron. Though he’d never done such work before, he leaped at the chance. For the past five months, he has facilitated meetings and activities – many online – and nurtured contacts with Israeli high school students from across the country. The teen group is small, with only about 30 members, a number Aaron constantly tries to increase through person-to-person outreach. He fits in this volunteer work with his first-year studies at Ben Gurion University of the Negev, where he enrolled last semester. Bringing the Peace Nowmessage to high school students is a Herculean task, Aaron well knows, both from his own experiences and those of the young people he coaches. Israel has turned sharply right in recent years, especially among youth, and peer pressure is tough to withstand. Still Aaron remains undaunted, grateful for those small successes. He’s thankful too for the practical skills he’s attained while withPeace Now, the insight he’s gained into Israel’s political system and society, and the opportunity to contribute to a cause he fervently believes in. However, soon these efforts will go on hold. In March, Aaron will start his army service, which means both his studies and volunteer work will have to wait. PeaceNow will have to appoint a replacement to the youth group leadership position. That’s just how things are in Israel. It’s just one of the realities Peace Now takes in its stride. But the youth activists aren’t necessarily “lost” forever. In their post-army lives they may end up serving the movement in some way. For example, one ofPeace Now‘s former activists has become a Ha’aretz reporter who specializes in civil society issues. And as the story below shows, military service can transform some Israelis into ardent doves. 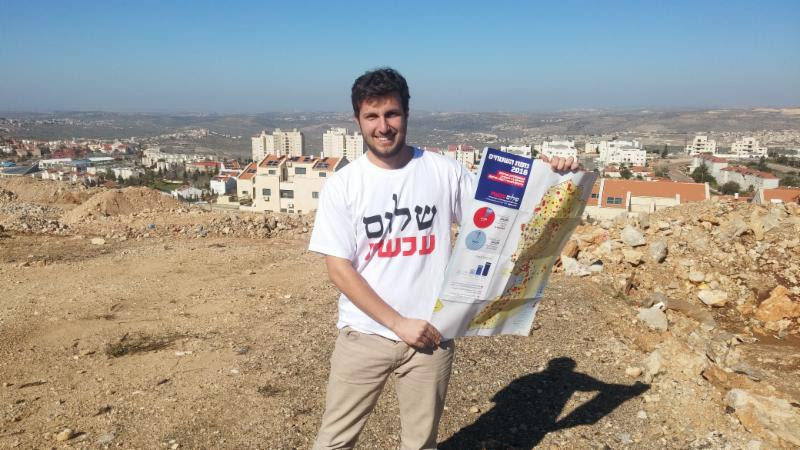 Eran Nissan with Peace Now’s settlement map. Though there’s no such thing as a typical Israeli, Eran Nissan, 26, might be considered one. With a father from Iran and a mother from a European, post-Holocaust family, Eran’s background embodies the Israeli melting pot and also the trauma baggage of both Mizrachi and Ashkenazi Jews. Plus, like so many Israelis, he measures his young life against conflict reference points: the first Gulf War, the second Intifada, the various Gaza campaigns. Like most Israelis of his generation too, he grew up in a state of both acute awareness and denial: aware of security threats and the need for a strong army, but only dimly conscious of Palestinian realities across the Green Line, just a few kilometres away from his home town near Kfar Saba. It was army service that opened his eyes. The occupation was breeding hostility, Eran felt, creating a never-ending cycle of violence. To his dismay he saw the settler movement and the “ultra-right, messianic, racist forces” gaining momentum. About three years ago, shortly after completion of his army service, he decided to join Peace Now. He was attracted to the movement because it had been started by soldiers (in 1978) and because it had a clear end-game agenda: the two-state solution. 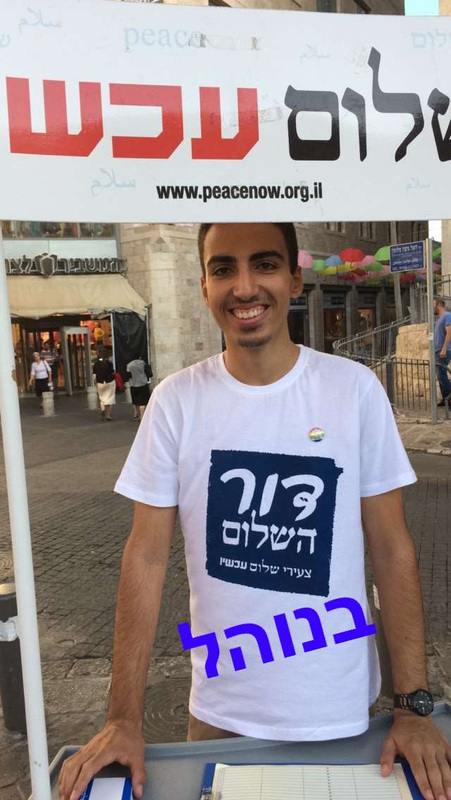 Now a second-year student at Ben Gurion University of the Negev, Eran acts as head of field operations for Peace Now in the southern region. He helps organize protest rallies, group discussions — especially among students — and other activities to educate the public. He works with a small but dedicated cadre of volunteers. When asked whether he’s successful, or whether he just hits a brick wall with his educational efforts, Eran says “both.” Often people “warm up” after encounteringPeace Now‘s well-researched, well-presented data on settlement growth and the attendant consequences. He draws heart from the fact that opinion polls consistently show a majority of Israelis favour a two-state solution. Still, he doesn’t underplay the right-wing trends in the country or the deep mistrust, on both sides, that he feels is at the heart of the conflict. What’s needed is a process of confidence building measures, he says. Instead the opposite is happening with settlement expansion, annexation of Palestinian land and desperate Palestinian acts in response. Eran believes many of his fellow citizens realize the status quo cannot go on indefinitely. He intends to do everything in his power to help persuade them that, after 50 years of occupation, it’s time for Israel to choose a more sustainable future.